The lush forested areas of central and western Africa are commonly referred to as “the bush.” The diverse forms of wildlife found in the bush–including great apes, elephants, and forest antelope–have long served as a primary food source for the inhabitants of the region. 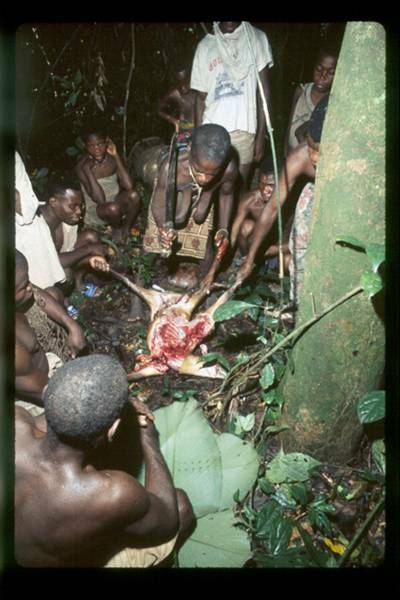 This bushmeat is an important food and trade item for poor families in rural areas, while many residents of urban areas prize bushmeat as a delicacy. While not ideal, historically this practice has been fairly sustainable. However, the bushmeat trade has now become a major commercial industry and a growing black market trade, as both demand and availability are ever increasing. A reported 1000 pounds of illegal meats enters the US per month, some of it found in airport customs with special agriculture-sniffing dogs, but much of it is sneaked in with tourists. This increased unregulated hunting has wiped out large populations of animals, while uncontrolled logging and mining operations have provided access to the heart of the forest and its inhabitants. Not only does this unchecked consumption threaten animal populations, but it also poses a serious public health risk as many popular bushmeat species, especially primates, can harbor potentially lethal diseases that jump from animal to man, such as AIDS, monkey pox and the Ebola virus. Bushmeat has even made its way to the Bay Area, including San Francisco and San Jose. Experts have found that African expatriates have had no trouble finding their desired delicacy if they know how to ask for it at certain markets and restaurants, apparently by code. The Bushmeat Crisis Task Force (www.bushmeat.org) addresses these issues and is beginning to form focus groups to get to the bottom of the local desire for this meat in hopes of creating a successful education and outreach campaign to protect habitats and wildlife. There are many opinions on whether or not bushmeat imports should become regulated and for what reasons it should be allowed into the country or region, however few can argue with the fact that bushmeat imports are creating a major crisis and threat to wildlife. Any opinions on the subject are greatly appreciated and will be forwarded to the BCTF. The Oakland Zoo supports the mission of the BCTF and various projects in Africa that deal with bushmeat, like The Budongo Snare Removal Project in Uganda. A benefit lecture and auction for the Budongo Snare Removal Project will take place on October 3rd at the zoo followed by a chimpanzee family celebration on October 13. Amy Gotliffe is Conservation Manager at The Oakland Zoo.